Often in the season of Lent we are encouraged to give something up, but this year we are encouraging you to get active! We’d like you to join us this Lent as we seek to run, walk or jog 1km on each of the 40 days of Lent (from Ash Wednesday on 06 Mar to Holy Saturday on 20 April). You may be pleased to hear that Sundays are a day of rest! To encourage you on your way, we’ll provide a short journeying themed Bible reading for each of the 40 days (no more than 4 verses! ), along with a prayer for each day of the week. 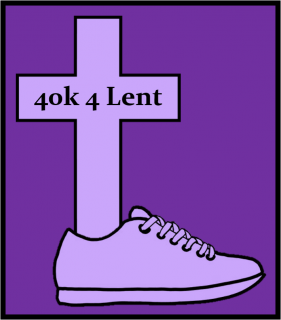 You don’t need to be a Christian to take part, 40k 4 Lent is open to anyone who wants to participate and the resources we provide are there to encourage you on your journey. We’d love to hear how you are getting on, so why not post an update on Instagram, Twitter, Facebook, Strava or other forms of social media, using #40k4lent. NB// The posts on Instagram and Twitter will appear on the live feed wall below, so we can share the journey. During the final week of Lent (Monday 15 – Friday 19 April), The Revd Andrew North will be running a loop between each of the Mulbarton Group of churches carrying a large cross; pausing briefly at each church to pray. Andrew will also be raising money for the charity, Combat Stress. If you would like to support Revd Andrew North in his run you can donate here or you can come to the churches on his run (approximate times listed below) and pray for him along the way. Whichever way you chose to complete the 40k 4 Lent, we pray that your journey will be both physically and spiritually rewarding. The readings and prayers will update automatically through the season, or you can scroll back and forward using the arrows below, or you can select a particular date. All Bible verses are taken from: Holy Bible, New International Version™ Anglicized, NIV™ Copyright © 1979, 1984, 2011 by Biblica, Inc.™ Used by permission. All rights reserved worldwide.